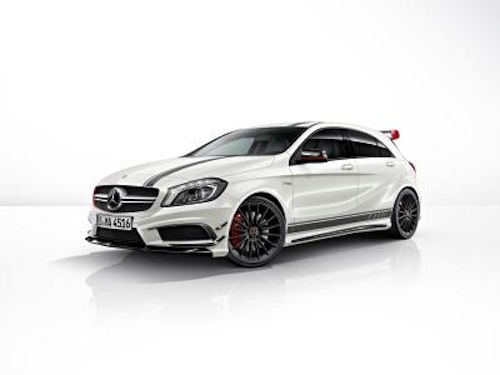 Exclusive performance has come to the compact class and its called the 2014 Mercedes-Benz A 45 AMG “Edition 1” that is both exclusive and expressive. Leave it up to Mercedes-AMG to come up with the A 45 AMG that sets the benchmark in the high-performance compact class. And then the performance division of Mercedes takes it to another level by offering the new 2014 Mercedes A 45 AMG “Edition 1”. The all-new exclusive performance compact is available for sale now in Europe. The 2014 A 45 AMG was recently unveiled at the International Motor Show in Geneva last month, but this new “Edition 1” stands apart even more in the new A-Class range. What makes the A 45 AMG and new “Edition 1” so enticing? It starts in the performance area with the A 45 AMG 2.0-liter four-cylinder turbocharged powerplant delivering 265 kW (360 hp) and a peak torque of 450 Newton meters (295 lb ft). The compact performance car will sprint from 0-100 km/h sprint in just 4.6 seconds and has a top speed of 250 km/h (electronically limited). Mercedes-Benz is targeting a new generation of buyers with the hot new compact. Mercedes will target predominantly urban buyers who are in the 30 to mid-40 age group with an agile high-performance vehicle. This new target group of buyers will be looking for efficiency and the A 45 AMG consumes just 6.9 liters of petrol per 100 kilometres. Mercedes says the new AMG engine already complies with the EU6 emissions standard. It comes fitted standard with a performance-tuned AMG 4MATIC all-wheel drive system that transfers power to all four wheels for optimum traction in wet or dry conditions. Mercedes has announced a new A 45 AMG "Edition 1" that stands apart even more in the A-Class range. It is exclusive in terms of both a technical level and in its unique appearance. It features a number of exclusive exterior and interior details that set it apart. The new "Edition 1" gets its exclusive exterior treatments that are motorsport-inspired. It gets two packages, an AMG Night package and the Aerodynamics package that come standard on the "Edition 1". On the outside, the A 45 AMG "Edition 1" Cirrus White exterior paint is complemented by AMG sports stripes in matt graphite grey on the hood, roof and sides. It also features red detailing on the radiator grille, exterior mirrors and rear aerofoil. The new “Edition 1” rolls on 8 x 19 AMG multi-spoke light-alloy wheels and wrapped in 235/35 R 19 performance tires. Red painted brake callipers can be seen peaking through the matt black finished multi-spoke wheels. Inside, the new performance compact features a sporty black and red interior with red contrasting topstitching on the AMG performance seats. They are finished in ARTICO man-made leather/DINAMICA microfiber, with the top section of the dashboard in ARTICO man-made leather and the AMG performance steering wheel in nappa leather/DINAMICA microfiber. The final touches are the E-Select lever with embossed AMG emblem and the "Edition 1" badge on the AMG Drive Unit. Mercedes has released German pricing on the new performance compact at A 45 AMG: 49,682.50 euros and A 45 AMG "Edition 1": 56,977.20 euros. Mercedes-AMG is embarking on a new era with the 2014 A 45 AMG. The German automaker is capturing a new target group of buyers and markets for the Affalterbach-based performance brand. Unfortunately those new buyers won't be in the U.S. The sales release date started April 8, 2013 with the market launch in Germany beginning June 2013.